House Speaker Nancy Pelosi, D-Calif., walks to a Democratic Caucus meeting at the Capitol on Tuesday. She told lawmakers to "stay focused on our purpose for the people" with the end of the special counsel's Russia investigation. The assertion by Attorney General William Barr that special counsel Robert Mueller found the Trump campaign did not conspire with the Russian government in 2016 removes, for now, a major focus of Democrats' messaging. But it has also given them an opening to turn to an issue they believe is more important to many voters anyway: health care. In Democrats' eyes, the Trump administration handed them the perfect opportunity on Monday night, when it filed in a Texas court case that would overturn the entirety of the Affordable Care Act. Democrats feel they won the House in 2018 in large part because of a back-to-basics message that included protecting the ACA. The Trump administration's efforts to overturn the law, including the expansion of Medicare, would jeopardize health care for millions of Americans, Democrats say, and could drive voters away from Trump and Republicans in 2020. Democrats were quick to pounce on the administration's filing in the Texas case. The Democratic Senatorial Campaign Committee issued a statement asserting that "voters detest the GOP's never-ending efforts to jeopardize their health care, they don't believe the lies Republicans tell about their records when they get caught, and they'll hold every GOP Senate candidate accountable in 2020." 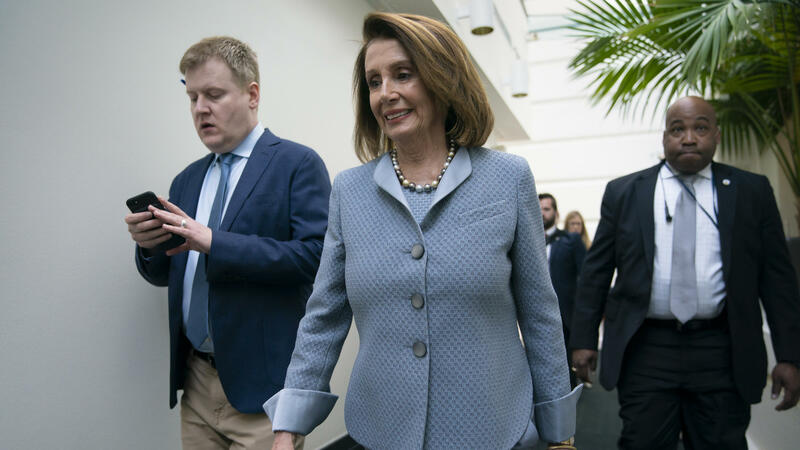 At a closed-door meeting of House Democrats on Tuesday, Speaker Nancy Pelosi, D-Calif., said it was important for Democrats to "stay focused on our purpose for the people: lower health care costs, bigger paychecks and cleaner government," according to an aide in the room. "We've just got to do the right thing. Stay focused on health care, rebuilding our country, raising people's wages. If we focus on that, we'll be all right," said Rep. Cheri Bustos, D-Ill., who is running the House Democrats' campaign operation for the 2020 elections. President Trump, as he arrived at the Capitol Tuesday for a meeting with Senate Republicans, said, "the Republican Party will soon be known as the party of health care," but it is not clear whether he has any plan to replace the ACA should it be struck down in the courts. Still, despite the animosity over the Mueller report, one area where Democrats believe they can work with President Trump is on lowering prescription drug prices — a rare issue both sides agree on. The topic has nonetheless eluded compromise for years. A spokesman for Pelosi confirms there are early, staff-level talks with the White House on possible legislation to lower drug prices. The talks were first reported by Politico. "We've been having some staff-level discussions with the Administration about lowering prescription drug prices, but they aren't negotiations," cautioned Pelosi spokesman Henry Connelly in a statement. "House Democrats promised the American people we'd take bold action to lower prescription drug prices, and that's what we're going to do." Wait for Mueller. That is what top Democrats used to say whenever it came to questions of impeachment. Well, special counsel Robert Mueller has delivered his report, clearing President Trump of coordinating with Russia to interfere in the 2016 election. And that leaves Democrats trying to pivot but to what? Now we know. The Trump administration yesterday revealed a new legal position. It is trying to strike down the entire Affordable Care Act without any replacement. And Democrats want to talk about health care, not Russia. NPR congressional reporter Kelsey Snell has been following this. She joins us now from Capitol Hill. Kelsey, it didn't take long for Democrats to figure out how they were going to pivot away from the Mueller report. So what are their plans? KELSEY SNELL, BYLINE: Honestly, this announcement, or this new strategy from the White House, was a political gift for Democrats. They have said all along that they won 2018 - won the House in 2018 - by presenting voters with a binary option. It was Democrats want to protect health care and coverage for pre-existing conditions. And they said Republicans wanted to take it away. Trump essentially locked that message in, and he revived it really loud and clear. And that's something that House Speaker Nancy Pelosi said when she talked to reporters earlier today. NANCY PELOSI: They say one thing, and they do another. They say they're going to protect pre-existing conditions as a benefit - pre-existing condition as benefit - and then they go to court to strip it. SNELL: So they're already moving on to this new message. And a lot of Republicans can't argue with Pelosi there. They don't want a repeat of 2018, and they know that they lost the messaging battle on health care. They don't want to fight that war again, particularly with the White House being so clear about repeal without any real replacement options on the table. CORNISH: Are rank-and-file Democrats, though, ready to leave the Mueller report and the prospect of impeachment behind? This was such a talking point - right? - for some on the campaign trail. Are they ready to just focus on, like, health care? SNELL: Well, there are some members who aren't ready to move on, and - but I'm told that it's a pretty small minority. I will say it is a very vocal minority, but it's a small group inside of the party. So Democrats met last night, and the leaders kind of agreed that they needed to refocus the message. One of them described it to me as getting back to policy basics and kind of - it was a back-to-basics policy altogether. It was absolutely reflected by Democratic Caucus Chairman Hakeem Jeffries of New York at his press conference today, who said it's all about kitchen table issues plan that they call the "For The People" Agenda. HAKEEM JEFFRIES: Nowhere in the "For The People" Agenda does it talk about Russia. Nowhere in the "For The People" Agenda does it talk about collusion. Nowhere in the "For The People" Agenda does it talk about obstruction of justice. SNELL: What they do talk about is health care, infrastructure, rooting out corruption, securing elections and wage security. But they're asking all of the committee chairs to help keep their members on that same message and not go off freelancing and talking about impeachment too much. CORNISH: What does this mean for the many other investigations that Democrat-led committees are conducting into President Trump? SNELL: Well, they're going to keep on going. So Democrats say Mueller found no evidence of conspiracy on the part of the - of Trump and his campaign when it comes to interfering in the 2016 election. But they've really seized on the fact that the letter didn't give a clear assessment on whether Trump obstructed justice. Now, Pelosi had this closed-door meeting with chairs of the six committees who are already involved in investigations. And they told me that - staff told me that in that conversation, they said that they were going to move forward on things like Trump's taxes and business dealings and investigations of wrongdoing by the White House staff and Trump's inner circle. CORNISH: That's NPR congressional reporter Kelsey Snell. Thank you.